People walk through the Los Angeles Central Library like they own the place because, of course, we do. From the Egyptian-Mediterranean-Venusian outlandishness of the original building to the golden Torch of Illumination atop its mosaic pyramid tower to the arcana-rich History Department in the catacombs of Lower Level 4, the Central Library belongs to all of us. Yet 25 years after its spectacular resurrection from a fire, too many people still take even this library, let alone its humbler cousins around the world, for granted. Susan Orlean is out to change all that. 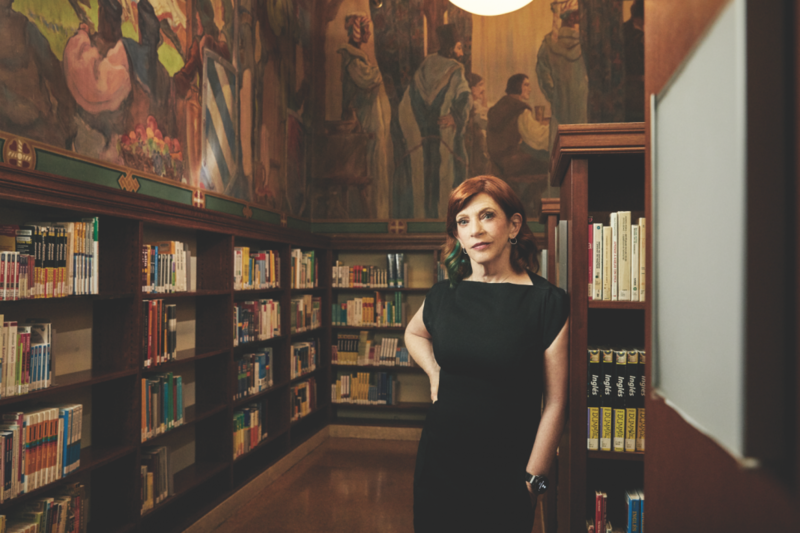 For three years, Orlean burrowed like a paper mite into this institution to research her new book about libraries—and about the rebirth of the Los Angeles Public Library in particular. You don’t have to know the library at all to appreciate The Library Book’s deft, loom-like shuttling among Orlean’s many story lines: the past and future of libraries as an institution, the role they’ve played in Orlean’s own life—and all the talented oddballs who keep a pacesetting, mighty urban library system like ours functioning. Beyond these pleasures, Angelenos especially can revel in Orlean’s fluent evocation of L.A. and its history, her feel for a city that seemed to rediscover its heart only after a still-unsolved 1986 fire burned a hole in it. Friendly, not stingy with a smile, Orlean has red hair shading toward auburn, with a peekaboo shock of green over one shoulder like something you’d find in a Martian locket. For a print journalist, she has a good radio voice—a brainy, nasal purr, full of peaks and valleys and unexpected swoops. It sounds like it comes out of a Princess phone. Some people apparently thought Orlean’s Los Angeles passport lacked the proper stamp. Yes, she spends summers in the Hudson Valley with her husband, who’s in finance; their teenage son; and her chickens. But when the school year begins, the family migrates to California. They’ve been renovating a Schindler house in Studio City with a view over the 101 and across the Cahuenga Pass, toward Hogwarts. The daughter of a mother who worked in banks—and regularly turned her loose in the neighborhood library—and a real estate developer who wouldn’t have minded being a writer instead, Orlean was born in Cleveland the year Disneyland opened (1955). Copies of Life and Look and Time slithered around the coffee table. “Writing was a form of magic,” she says, and she can’t remember not wanting to practice it. Orlean went to college at the University of Michigan, imbibing Faulkner and Joyce by the shelf. After graduation she did tours of duty at the Willamette Week in Oregon and the Boston Phoenix. Pretty soon, she broke in at The New Yorker, where she’s spent the better part of her career. So I understand the grilling she got that afternoon when she took questions about her nascent book. It wasn’t me who’d asked any of the obnoxious questions, but they wouldn’t have been completely out of character either. I’ve been that guy, that homegrown, annoying “how dare you enjoy L.A. without my permission?” guy. “I have a secret urge to teach readers, ‘You can be more curious, too,’ ” she says. Incuriosity drives Susan Orlean crazy. You don’t write books about orchid thieves or a terrific biography of Rin Tin Tin if life bores you. A lot of Angelenos have been. We’ll let slights from San Diego or Phoenix pass, but New York is different. 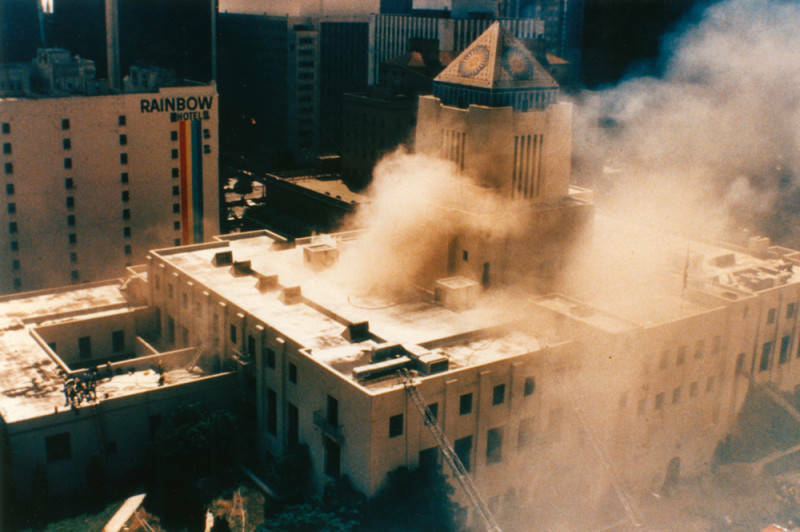 Go back through decades of The New Yorker or especially The New York Times, and you’ll find much the same indifference to, cluelessness about, occasionally funny ridicule of, glamour-chasing in, and, only recently, a grudging regard for, Los Angeles. Maybe the most famous New Yorker cover ever, Saul Steinberg’s 1976 “View of the World from 9th Avenue,” presents an unapologetic New Yorker’s foreshortened perspective on the country, with trucks on a crosstown street assuming much more dimension and detail than a faint orange boulder in the distance labeled “Los Angeles.” That stung—even if Steinberg’s first version, accompanying the magazine’s 1966 feature on Southern California, looked at America exactly backward. Towering ornate letters spelled out “L.A.” in the foreground, with New York, in the distance, just a pinprick. She needn’t have worried. Perversely lovable as Didion can be, the world still gives her a migraine; it gives Orlean a lime rickey with a twist. Weird subjects just reliably find her. First she wrote puckish vignettes for The Talk of the Town. From there, she graduated to her now-signature explorations of the arcane made fascinating, but also the familiar made new. Her engaging, ingenious 1990 book Saturday Night sounds ridiculously simple: a hopscotching guided tour of the different ways Americans ring in the Sabbath. Then you read it and wish it were a magazine, so you could take out a lifetime subscription. She admits, “I have a secret urge to teach readers, ‘You can be more curious, too.’ ” Incuriosity drives Susan Orlean crazy. You don’t write books about orchid thieves or a terrific biography of Rin Tin Tin if life bores you. Orlean’s rare talent is her ability to make her curiosity contagious, to replenish in readers their capacity to wonder about stuff that they’ve never heard of before or that they always walked past but never really saw. Often she’ll start with her first impression of someone, mentioning the things we might notice if we were there (and blessed with her gift of offhand portraiture). She opens her best-known book, The Orchid Thief, like this: “John Laroche is a tall guy, skinny as a stick, pale-eyed, slouch-shouldered, and sharply handsome, in spite of the fact that he is missing all his front teeth.” Typical Orlean. She ropes you in. 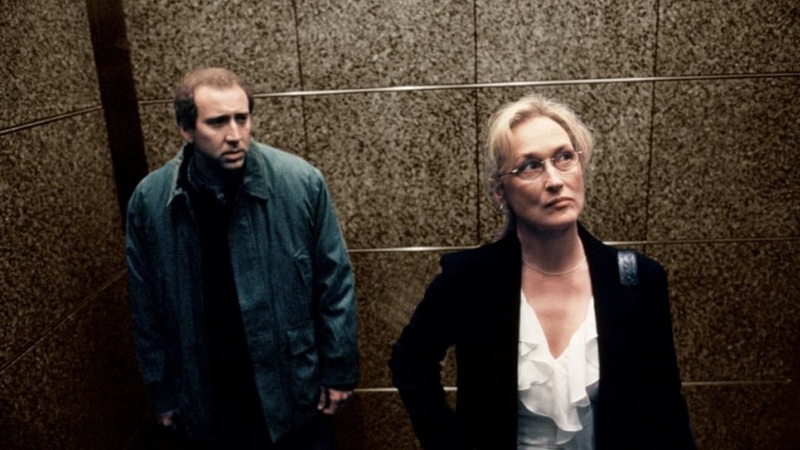 Entrusted to the surrealist screenwriter Charlie Kaufman, Thief became the movie Adaptation, a schizoid sublimation of his own writer’s block that starred Meryl Streep as Orlean. When Orlean first read the script, she was shocked. Now she can quote from it. In The Library Book she introduces the Library Foundation’s president, whose long ago tour of the building planted the seed for her book, this way: “[Ken] Brecher is as thin as a pencil and has bright eyes, pure white hair, and a brisk, barking laugh.” If Brecher ever misplaces his driver’s license, that page will do nicely till it turns up. One mark of Orlean’s growth as a writer about L.A. is her ability to reinvent a local story that a reader thinks he or she already knows by heart. Perfect example: her version of the beloved chestnut about Ray Bradbury writing Fahrenheit 451 at UCLA’s Powell Library on an old pay typewriter, one dime at a time. According to the version most of us have heard (or told) for years, Bradbury holes up in the library as a refuge from his noisy young family. But Bradbury was always part little kid himself. To characterize such a childlike genius as avoiding his own children sounds not only unkind, but unlikely. Orlean gently shifts the emphasis in a way that makes much more sense: “When he tried to work at home, he spent more time playing with his children than writing.” Call it intuition or empathy, or call it fine writing, which can’t survive without either; Orlean gets this L.A. story right at last. The Library Book probably won’t become the perfect documentary it surely could have been, if only because FrederickWiseman’s 2017 film Ex Libris, about the New York Public Library, got there first. But who needs more footage of stone lions when we have Orlean to distill the original instructions for cleaning LAPL’s robed statue Civilization of the rotunda? “Civilization,” she observes dryly, “required occasional dusting with a dry cloth.” Pictures fail. 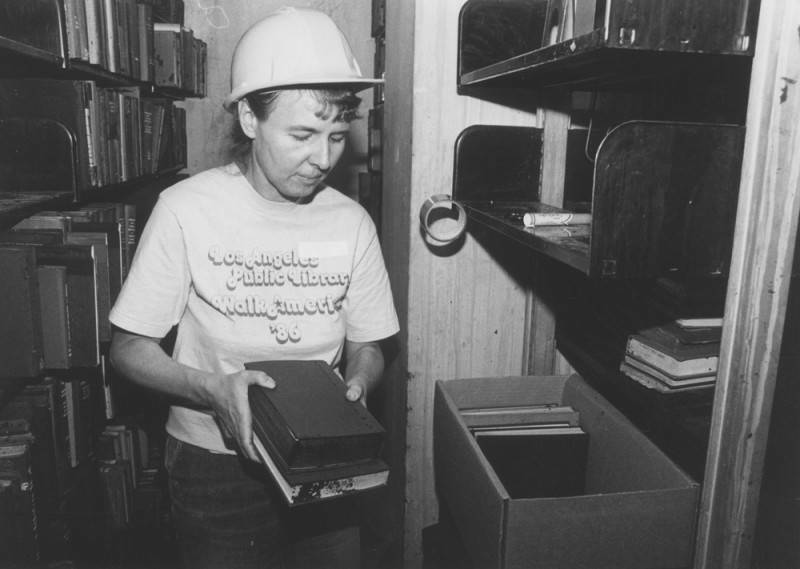 Marianne Black, a staff member from the Hollywood Branch, helps pack books in the closed stacks at Los Angeles Central Library after the fire on April 29, 1986. I was there that day in 1986. I was just home from college, writing novels everywhere but on paper. A call came out over the radio: Volunteers were needed to help save hundreds of thousands of books water-damaged in the fire, which had swept through the 1926 building, scorching its bound volumes, vaporizing a rare edition of Don Quixote, licking at the statue Civilization’s very hem. I had nothing else going on. Plus, I was an actual LAPL cardholder, which seemed like more than a lot of people could say. How many would show up? A dozen? A hundred, tops? As it happened, whatever their reasons, 2,000 other people came out. Even though I was born here, for the first time I felt like an Angeleno. Has it ever been a coincidence that, whether you’re headed north or south into downtown, the surest way to find the library is to follow Hope Street?